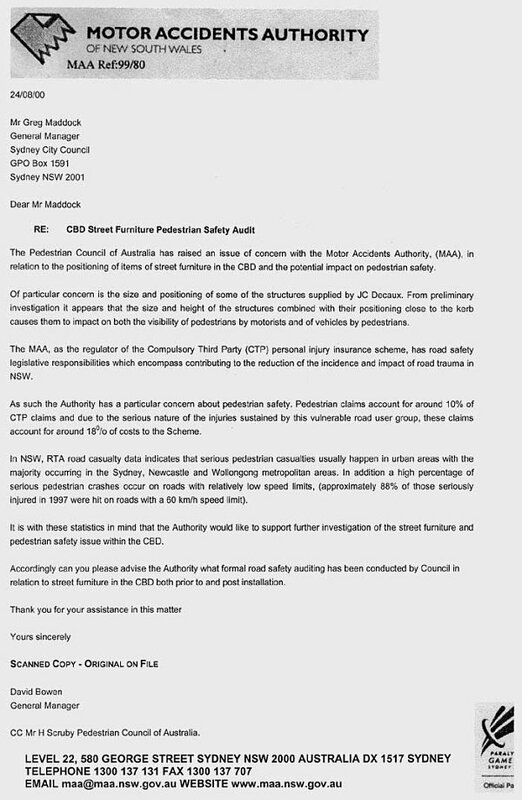 The Chairman of the PCA, Mr Harold Scruby called on the Lord Mayor of the City of Sydney, Councillor Frank Sartor, to immediately ban scrolling billboards in the CBD before someone is killed. Mr Scruby said; “JC Decaux has today announced they will be converting their static billboards to rolling billboards. Apart from many of these billboards already being positioned in extremely dangerous locations at pedestrian crossings and too close to kerbs, where they already obstruct the vision between motorists and pedestrians, they will now also divert motorists attention by scrolling. ”It is not just our view that these devices are potentially lethal, JC Decaux confirms it in today’s press (quote): ‘Research published by JC Decaux last year suggested ‘two-thirds of people look towards a site when it scrolls, drawn by the movement, and of those two-thirds, nearly 100 per cent go on to look at the following panel. 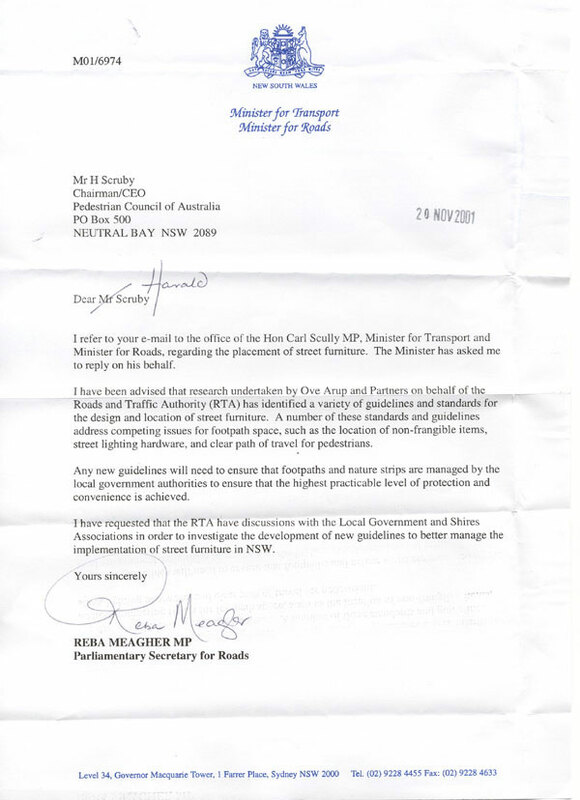 “In August 2000, the GM of the Motor Accidents Authority, Mr David Bowen, wrote to the GM of the City of Sydney expressing his serious concerns about street furniture (quote): ‘Of particular concern is the size and positioning of some of the structures supplied by JC Decaux. From preliminary investigation it appears that the size and height of the structures combined with their positioning close to the kerb causes them to impact on both the visibility of pedestrians by motorists and of vehicles by pedestrians … Accordingly can you please advise the Authority what formal road safety auditing has been conducted by Council in relation to street furniture in the CBD both prior to and post installation.’ “Mr Bowen never received a reply to his letter. Mr Scruby added: “In its 1995 publication, Road Environment Safety - A Practitioner's Reference Guide to Safer Roads, the Roads and Traffic Authority (RTA) states: ‘Landscaping and other street furniture must not obstruct visibility between vehicle drivers and pedestrians.’ Nearly 18 months ago, the RTA commissioned a comprehensive study by Ove Arup to examine the safety aspects of street furniture and to provide guidelines for its location. In spite of repeated requests by the PCA, that report has never been released. 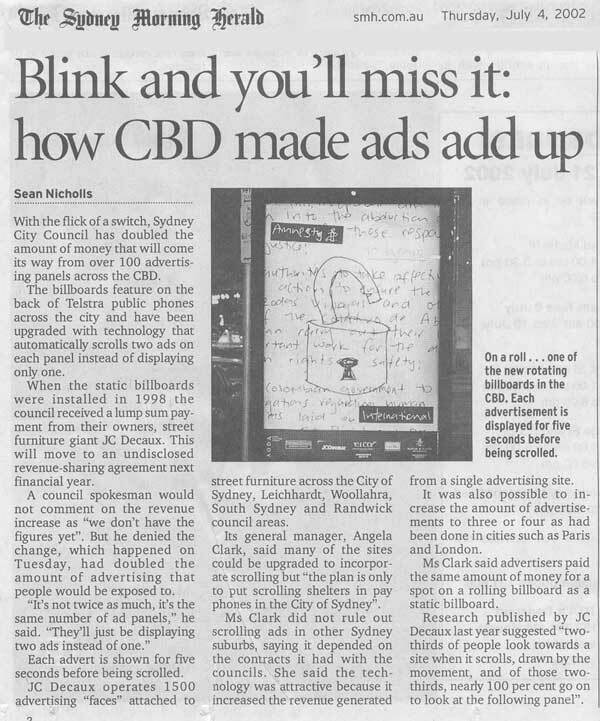 ”Councils receive a lot of money from street furniture organisations and it would appear this has blinded them to the need to address all safety issues before they are installed and permitted to incorporate distractions, such as rolling billboards. Pedestrian deaths are already up 13% on last year. We also call upon the Minister for Roads, the Hon Carl Scully and the Chairman of STAYSAFE, the Hon Grant McBride to immediately demand that these devices be prohibited until all safety issues have been independently audited and fully addressed.” Mr Scruby said.